Charbonneau Commission: Accept the price, take the blue pill, don’t complain. – WHO KILLED THERESA? Charbonneau Commission: Accept the price, take the blue pill, don’t complain. 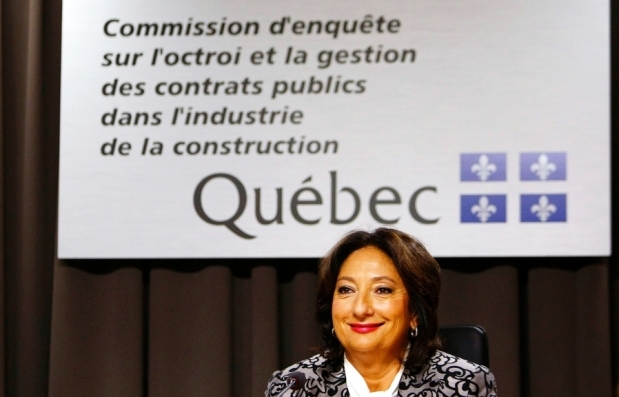 The Charbonneau Commission, Quebec’s public inquiry into how construction contracts where awarded for public projects, is to resume tomorrow morning. The Montreal Gazette has two good articles on the story so far in this weekend’s paper. The first article asks how far will the Commission probe into the connection between big government contract money, organized crime, and the political process in Quebec. The second article is an examination of how contracts were awarded in Montreal. The Gazette suggests a pattern in the process, which suggests a possible gaming of the contract system. Notably the top two constructions firms in Quebec – Simard-Beaudry Construction and Construction Frank Catania et Associés Inc.(both with links to organized crime) – most often were awarded contracts and managed to split the award pot almost 50/50 (approx. $60M each). Also, neither company bid on a specific contract when the other had decided to bid on it (one would not participate in the process if the other decided to engage). Finally, the Gazette also points out that some construction companies never won contracts. I always find these stories of bid rigging kind of difficult to follow, so let me just lay out for you what is being suggested: Simard-Beaudry and Frank Catania, Inc. would meet prior to bidding on contracts and mutually agree who would bid on what this round, and who would sit out. The company bidding would secretly meet with a contract rep with the government and agree on a price (the bid would be roughly in line with the cost estimate provided by the government). The company would pay the government contract rep some incentive secretly for his services. Other companies would be instructed by the lead company not to bid, or to bid with a figure significantly higher than the estimate price, in exchange the lead company would award sub-contracts to the lesser companies for sitting out or providing bogus bids. In this scenario, everybody wins. The lead company gets greased by the premium above what the project truly would have cost, the government reps get greased with some sort of pay-off from the lead construction company, the lesser companies get greased with sub-contracts, and the other lead company sitting out this round gets greased in the knowledge that they will then take the lead on the next big government construction contract. Oh, and one last piece of the puzzle; part of that lead company premium? That’s used to fund political campaigns; an equal portion to all parties, a manner of hedging your bets so that everyone is complicit and the status quo continues. Everybody wins except the taxpayer; they wind up paying for a highway overpass that could have been completed at 1/3 of the price had the fundamental process of Western competitive economics been allowed to take place, and the contract awarded to the true low bidder. And you wondered how Pauline Marois could afford that mansion on Ile Bizzard? How do I know this is what has likely been taken place in Quebec construction for the last 100 years? My father worked in construction in Quebec all his life. That’s how. I have often thought that if you wanted to get to the real bottom of Theresa’s death, you might need to take a long, broad look at the relationship in Quebec between politics and corruption and money. Some crimes aren’t cause-and-effect. Some crimes are wheels-within-wheels, and result from bigger systemic problems. An inept police force, a lackadaisical educational structure; these are systems that feed off Quebec’s political engine. If a province and it’s people accepts that $347 million is a fare price for not rocking the boat (and this is exactly the number The Gazette is suggesting) , and they would rather have that money going to maintain the sub-standard status quo in Quebec, just so long as everything continues to basically function in Quebec, albiet at a terrible level of service, then it’s alright that we use that money so that a very few people enjoy a higher standard of living. If that is true, then don’t complain when your morning commute is 10 minutes longer each year due to a continuous ballet of pilons; don’t complain when your CEGEP system is at the point of anarchy for, apparently, no reason; don’t complain when your police forces behave like thugs, and seem to be at odds with one of the fundamental tenants of law enforcement: protecting citizens. Accept the price, take the blue pill, and don’t complain. The Charbonneau Commission reconvenes tomorrow morning. You can watch it here.